I am blessed to work with some amazing people at Connecting Caring Communities. One of them is my friend, colleague and fellow Friendship House coordinator, Janet Mendenhall. Janet and her family live in the Valley View Friendship House, and part of her work in that neighborhood is a community garden. Recently, she shared her thoughts on what she has learned from tending her garden. I really appreciated what she had to say, and wanted to pass it on to you. I have been gardening lately. Actually, that is too lofty a description for what I do. That conjures a picture of someone outfitted with a proper gardener’s hat and gloves and maybe even one of those expensive long-sleeved shirts that protect you from skin cancer and keep you cool at the same time. Or just the right tools from Smith and Hawken. Or maybe even some new, hip, organic way of growing food and raising fish and recycling your rain water all at the same time. I am doing none of this. I found an empty lot, convinced a man with a tractor to till it, went to the local feed store and bought some seeds. My rows aren’t even straight; my tomatoes are neither subdued by stakes nor carefully caged. My honeydew is too close to my zucchini and despite my daily rerouting is a bit clingy to its neighbor. I battle weeds with an old hoe found in our ancient garage, owned by the ancient man who preceded us. I am clad in old tennis shoes and a pair of my son’s old soccer shorts and a T-shirt. My ungloved hands are calloused. It is far from glamorous. Or hip. But some days, it is good. Gardens are spiritual places. God chose to begin life there. And it was good. New life arising from the garden soil. And God chose to redeem life there. And it was good. New life rising from the garden soil. They are places of hope. And growth. And nourishment. Mouth-watering food on my plate just months after dropping two dollars’ worth of tiny seeds into a hole. It is almost that simple. Well, except for the weeding, and watering. And the dirty hands. And the weeds. And the ants. And the weeds. Gardens are places of learning, too. Down-to-earth lessons, like calculating the potential sprawl of indeterminate tomatoes, and just how big a red squash can actually grow, and making sure the bean seeds your neighbor gave you aren’t the kind that need a trellis constructed for their upwardly mobile tendencies. And spiritual lessons, like people are more important than pumpkins, when a passerby prematurely plucks the single surviving pumpkin you have been pandering to for months. And how, like relationships, you can’t help anything grow without being intentional. Or nurturing. Or providing refreshment. Or getting your hands dirty. And how our own lives need careful cultivation to produce good fruit. And how they need little or nothing to produce weeds. And how quickly weeds grow. And how difficult it is to remove those weeds. And how quickly they come back. Without even trying. It is often in gardens that we make connections: to other gardeners as we work the ground together, to the earth as we recognize its richness, and especially to our Master Gardener, who does good things everywhere, but is especially handy in the garden. A disclaimer to begin: I realize this post is longer than I usually write – a LOT longer. A word of explanation is in order. A few years ago I was preaching through the Gospel of John, always on the lookout for fresh ways of retelling familiar stories. One book I had read on sermon writing suggested telling a story as if you were describing a movie. How would the shots be set up? What would the dialog be like? How would the music sound? So I decided to give that approach a try, and here is the result. Our class at Beltway will be dealing with this story this coming Sunday (Aug. 4), so I thought I’d pull this out and share it. Like I said, I know it’s longer than my other posts, but I hope you will find it encouraging and thought-provoking. We fade in on a gray screen. We can see movement and shades within the gray, but we really can’t tell what we’re seeing. Then, as the screen gradually continues to lighten, we can tell that it is dawn, and that we have been looking at gray clouds moving against the lighter gray sky, just before sunup. We hear the main title music playing, a haunting and beautiful melody, led by strings and flutes. The sky grows steadily brighter and brighter, changing in colors from gray to pink to rose to orange, until finally the sun breaks over the horizon and it is day. The words fade out, the camera zooms in, and we are heading up and down the narrow, twisting streets and alleys of the city. It is still very early in the morning, and not many people are out yet. We see a woman stirring a small cooking fire next to her one-room house; we pass another woman carrying a jar of water. Finally, the camera takes us into another house. It is almost too dark to see, but there on the wall, we can just barely make out the faint shadows of a man and woman, locked in love’s embrace. Suddenly, there is a noise and a commotion. The music changes from the sweet, soft melody of the flutes to a blaring cacophony of brass instruments and drums. A dozen or more men come bursting into the room as the lovers try to escape. There are temple guards and other officials among the men, and they are led some from the group known as the “Separated Ones;” Pharisees, they call themselves. They grab the woman and begin to drag her from the room, allowing her just enough time to grab a robe for her to partially cover herself. In the confusion, the man escapes – or did they let him go? Cut to a much more peaceful scene, back at the Temple. Instead of the shouts and curses of the previous scene and the glaring trumpets, now we hear only soft footsteps. We see a group of a dozen or so men walking through the outer courtyard area. The footsteps we’re hearing come from them. They are a diverse lot, ranging in age from about 20 to perhaps 50. The camera tracks with them as they enter the courtyard. At the head of this motley group is a rabbi. We can tell he is the teacher, because draped around his neck is a long prayer shawl of the type some rabbis wear. It is so long, it nearly touches the ground. It is white with blue stripes, and tassels at each end. The young rabbi is in his early thirties. We cut to a close-up of this man. We can see his hands are callused; he may be a teacher now, but he is no stranger to hard work. The camera cuts to his feet. He is wearing sandals, and his feet show the dirt of the road he is walking. Cut to his eyes. Even in his young face, we see the beginnings of laugh lines around his eyes, and in those eyes burns an intensity that startles us – a mixture of joy and seriousness, pain and humor. He is talking with the men in his group as they walk along together, and although we can’t make out what they’re saying, it’s obvious as we watch that they have been together long enough to be comfortable with each other. He is their teacher and they are his students, but they are also friends, and it shows in their manner. They are heading for a particular corner of the courtyard; they’ve been there before. The scene shifts from them to others in the courtyard. In a series of rapid cuts, we can feel the excitement building as people point and comment as the group walks by. “There he is,” we hear one man say. “What story do you think he’ll tell today?” another man asks. “Who is that?” asks a third. His companion answers, almost in a whisper, “That’s that teacher everyone is talking about – Jesus of Nazareth.” Meanwhile, the rabbi leads his little group to the spot he has in mind, and as is the custom for teachers of that day, he sits down. His disciples gather around him, and the lesson begins. We cut back to the woman; the men around her are still shoving and pushing her, cursing her to hurry up. She is desperately trying to hold her robe together and preserve some shred of dignity and modesty, but she isn’t having much luck. The camera pans from the woman to a group of three of the leaders of this group, walking behind. We listen in on their conversation. “But the Romans would never let us execute someone for something like this; you know it, I know it, and he knows it,” his friend protests. “Yes,” chimes in a third man, “but more than that, he’ll lose the support of that rabble that follows him. He can’t very well talk about forgiveness and mercy on the one hand, and executing her on the other. They call him, ‘The friend of sinners’ – some friend! No matter what he says, we can discredit him publicly.” The camera stays on this man’s face, and we see the triumph in his eyes. It is a thoroughly unpleasant look. The camera stops moving as we watch the group continuing marching through the street; just ahead of them is the Temple gate. The scene cuts back to Jesus and his listeners. Many from the crowd have wandered over to hear him speak. It is early autumn, during the feast of Tabernacles, and there are a lot of folks here who have heard about this rabbi from the Galilee. He is retelling a story that some have heard before. The camera tracks across the scene, to give us a chance to see both Jesus and his followers, listening with rapt attention. He pauses for a moment, to let them think about what he’s just said. He is about to continue, when heads in the crowd begin to turn. A mob is heading for him. “What’s going on?” some in the crowd ask. They grasp in shocked surprise at the sight of the indecently-dressed woman, so obviously a prostitute. More and more people hurry over to the corner of the courtyard where Jesus is sitting. After all, excitement is where you find it, and suddenly, this day just became much more interesting. The crowd in front of Jesus moves aside, and up walk the leaders of the mob, with the guards dragging the woman along. For a long moment, no one says a word. During this silence, we have a series of quick camera changes, as we see first the Pharisees and teachers, staring angrily at him – cut to some of Jesus’ disciples, puzzled by this interruption – cut to the woman, bruised and scraped at the rough treatment she’s been receiving, and bleeding from her knees and elbows, embarrassed and humiliated at what is happening – cut to Jesus, still sitting on the ground, looking up at the ringleaders with a sort of a sad, resigned look in his eyes. We watch as he slowly stands up. The camera cuts back to the scribes, as with a jerk of their heads, they motion to the temple guards, who give the woman a final shove. She tries to hide, but there is no escape. They are enjoying her shame, and they make her stand there. The camera moves to one of the Pharisees, dressed in his robes, proudly wearing all the badges of his office and symbols of his heritage. He is proud and sure of himself, and his pride can be seen in the way he is dressed, and heard in the way he speaks. The camera holds on him, as he looks around at the audience. He is sneering with obvious pleasure. This is his moment of triumph: all the planning, all the preparations, all of it for this very moment. At last, he looks back at Jesus. To this man’s very great surprise, Jesus doesn’t say a word. He doesn’t try to say anything, doesn’t try to get away, doesn’t try to explain his way out of an obviously put-up situation. Instead, the teacher just bends down, sort of sitting on his haunches, and begins to write in the dirt. The noisy crowd has grown completely silent. Jesus’ disciples are also silent. In fact, we don’t hear anything except the wind blowing. What is he writing in the dust? We can’t tell. Is he just doodling, to give himself time to think? Or is he writing something – a verse of scripture perhaps? Perhaps a verse like, “Do not share in the iniquity of evildoers”? Or maybe, “Do not conspire with those who tell lies”? Whatever he’s writing, it takes a long moment, and the silence grows. While this is going on, the camera moves in a circle around Jesus, always focused on him. His face is calm as he continues to write. We see his hand, drawing in the dirt. We cut back to his eyes. They turn one way to look at the woman, and we look at her, too. She sees him look at her, but she can’t bear to look back, and she stares at the ground. Then we see his eyes look over at the scribes, and we look at them. Their eyes are hard, bright and shining with anger. He looks at his disciples, and we see their concern. They know the master is in trouble here. Not a word is spoken during these cuts. Finally, the Pharisees begin to press him. “Come on, teacher,” they say. “What should we do with her? Do we stone her or not?” Again we have a series of camera cuts, from Jesus to the scribes to the woman, to Jesus, to the crowd. Finally, in a wide shot where we can see the whole scene, Jesus stands up and looks at them. We cut to a close-up of his face. “Fine,” he says, in a quiet and calm voice. “Whichever of you is without sin may be the first to throw a stone at her.” Then, he stoops back down and resumes his writing. “No one, sir,” she answers. The camera holds on her for a moment. We see her expression change, and she begins to smile – a real smile, not the one she uses on customers. Something has changed in her; we see hope beginning to dawn in her eyes. The camera cuts back to Jesus, the music comes up with a swell, and he smiles back at her as we fade in the words, “The End,” and then slowly fade to black. Except it ISN’T the end. You see, I believe each one of us is somewhere in this story. Perhaps you are like the woman in this story before she met Jesus. You may not be an adulterer, but maybe you can identify with her. Everyone she’d ever known had betrayed and used her. She had thrown away her hope, given up on life, and now she just wanted to get through each day with as little pain as possible. Sound familiar? Perhaps, like her, you’re desperately hoping for forgiveness, but knowing you don’t deserve it. But she found grace and forgiveness from this teacher, and you can as well. Or maybe you’re like the Pharisees here. They were so sure of their absolute rightness, and they had all the answers. They despised people who didn’t measure up to their standards of right and wrong. After all, didn’t their standards come from the law? And hadn’t Moses given them the law so they could demonstrate how righteous they were, and how sinful everyone else was? Maybe you can identify with the Pharisees. You see, I can. I grew up in church. I knew right from wrong. I didn’t disobey my parents or do drugs or get into trouble. And I knew the rules. I knew that keeping the rules was the way to get God to love me, and for me to prove how good I was. And everyone knows, we shouldn’t associate with anybody who doesn’t measure up to how the rules should be kept. If people want to follow God, let them clean up their act and prove they’re sincere; then we can talk. What about Jesus’ disciples? What were they thinking during all this? I’m sure they were confused, torn between knowing that you can’t just overlook sin, but also knowing that Jesus came to demonstrate God’s love and forgiveness. But they must have wondered: how far does that forgiveness extend? I know they wondered that, because I’ve wondered that. I was discussing this with an older Christian recently, a man whom I really respect and admire in the faith. He said he had been struggling with this, and he asked out loud the question many of us have wanted to ask: are there limits to grace? I don’t know the answer to that question, but I do know this: as far as the Bible tells us, the only times Jesus ever condemned anyone, it was for self-righteousness and spiritual self-importance. On the other hand, every time Jesus dealt with people who came to him in need, sinners looking for a fresh start, every time he had to choose between showing more grace versus less grace, he always showed more. May the same be true of us. [Bob Reidel: “Mike – Saw you hangin with Bill Maher. I had no idea you were a liberal. Really blew me away. Love everything you do but now that I know who you really are, I won’t be tuning in to watch anything your involved with.”] Well, hi there, Bob. How’s it going? Since your comment is not the only one of its kind, I thought I’d take a moment to address it.Bill Maher is opinionated, polarizing and controversial. I get it. So is Bill O’Reilly, which is probably why I heard the same comments after I did his show. (“How could you Mike? How could you?”)Truth is, every time I go on Fox, my liberal friends squeal. And every time I show up on MSNBC, my conservative pals whine. Not because they disagree with my position – everyone agrees that closing the skills gap is something that needs to happen. No, these days, people get bent simply if I appear on shows they don’t like, or sit too close to people they don’t care for. What’s up with that? Is our country so divided that my mere proximity to the “other side” prompts otherwise sensible adults to scoop up their marbles and go home? Back in 2008, I wrote an open letter to President Obama, offering to help him promote those 3 million “shovel-ready” jobs he promised to create during his campaign. (I suspected they might be a tough sell, given our country’s current relationship with the shovel.) Within hours, hundreds of conservatives accused me of “engaging with a socialist,” and threatened to stop watching Dirty Jobs with Mike Rowe if I didn’t come to my senses. I like his comments. Very much. And I want to add a few of my own. First of all, when and from where did we get the idea that people we disagree with politically are the enemy? We may have a differences of opinion about what is good public policy, or how the government should or should not respond on a given issue, but that does not make us enemies. I used to love to read Molly Ivins, may she rest in peace. Yes, she was loud, brassy, obnoxious, and as liberal as the day is long. But she was also outrageously funny, and she made me laugh, and and she made me think. Molly used to love to tell a story about John Kennedy and Barry Goldwater. They had served in the Senate together in the 50s and were good friends. In the early 60s, when it became that Goldwater was going to be running against Kennedy in the 1964 Presidential election, they were looking forward to it, and had already begun having discussions about a sort of traveling debate roadshow. The idea was for a series of debates, where the two of them would slug it out over public policy before the cameras, then go out for a drink together after the show. Democrats. Republicans. Progressives. Conservatives. We need to listen to each other. We NEED each other. Compromise is NOT a dirty word. It means recognizing that sometimes the other fellow also has a good idea, and maybe we are not perfect in our judgments and opinions. Are we so afraid of the weakness of our political views that we cannot stand to have them questioned? Are we so intellectually lazy that we can’t form a decent argument in support of our position? Or have we just completely lost all sense of common decency and respect, so that we simply can’t talk with each other anymore? Standing with our fingers in our ears and yelling “NO” to those who disagree with us is the behavior of a three-year-old throwing a tantrum, but we need to do better as a nation. Especially a nation whose founders believed in the power of ideas. I was visiting with some friends the other who knew me when I was a pastor in Haskell, and they asked, “So, what is it you’re doing now?” It’s a fair question. What that means is both simple and profound. Simple, because God created humans to exist in relationship, with Him and with one another. Profound, because it’s not easy to do. As far back as the Garden of Eden, God said, “It is not good for the man to be alone.” In that context, of course, He was speaking of the relationship between husband and wife, but the principle applies to life in general. God Himself exists in a perfect relationship, the beautiful mystery of the Triune, Three-in-One Being, of God the Father, God the Son, God the Holy Spirit. And He created us to exist in relationship with Him and with others. Unfortunately, those relationships were damaged along with everything else when our first parents sinned. As Christians, we would say that Jesus came to rebuild those relationships, to provide a way for us to have our relationship with God restored, and to show us how we ought to live with one another. to proclaim good news to the poor. and make an everlasting covenant with them. In other words, the most important thing is to recognize the relationship with God on a community level (OUR God), on a personal level (all YOUR heart, soul, mind, strength), and on an interactive level (love your NEIGHBOR). A Friendship House is just that: it’s a house where a CCC staff member lives with his or her family. Our house is in the College Heights neighborhood of North Abilene, near Hendrick Medical Center. 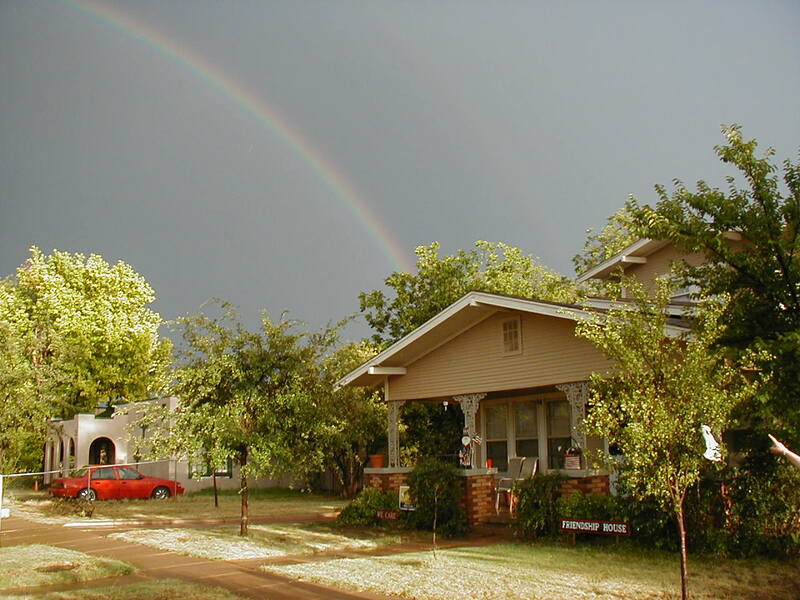 CCC also has Friendship Houses in the North Park neighborhood, and in the Valley View neighborhood. We work with our neighbors to get to know them, to help them get to know each other, and to work together to build a stronger, better, safer community for everyone. We do many different things at the Friendship House, including an after-school program, summer activities for neighborhood kids, block parties, prayer walks, neighborhood cleanups, and more. But these activities are NEVER done as ends in and of themselves; they are all done with the goal of meeting neighbors, building relationships with neighbors, then mobilizing those relationships to grow a better neighborhood. We want to allow those relationships to develop naturally and organically, listening to each other and growing together. It means that we value relationships above things. We believe that by building relationships, we can restore the fabric of our community, and ultimately, our society. It means that we seek mutually-enhancing relationships. In other words, we don’t want to maintain a traditional service provider – client model. We want to walk beside our neighbors and learn from each other. It means that we seek to build on the strengths inherent in every neighborhood and work with neighbors to grow and develop new strengths that can benefit the entire community. Some people call this community development, or intentional neighboring, or missional living, but really, it’s just living out the Kingdom principle of showing our love for God but loving one another. When we do this in gentleness and humility, we discover that we don’t have to “take God to the neighborhood” – He has been here all along, waiting for us to love people in His name. Want to know more? Our website is currently undergoing to a major rebuild, but you can go to WeCareAbilene.org for more information, or you can visit us on Facebook. We appreciate your prayers, and if you feel so led, we can always use additional financial support. Meanwhile, let me encourage you to come along beside us by getting to know YOUR neighbors, where YOU are. Proverbs 27:10 says, “A neighbor nearby is better than a brother far away.” Love the people God has placed near you. It seems to me that if more of us would do this simple thing, the Kingdom of God would grow and spread beyond our wildest dreams. It’s no surprise to anyone who knows me, that I love the movies. I like movie soundtracks. I love throwing out movie quotes at appropriate moments, sometimes just to see if anyone will catch it. And frankly my dear, I DON’T like much of what has been coming out of Hollywood lately. Not because of the content, although that is certainly bad enough. No, my complaint is that most directors, producers and screenwriters seem to have forgotten how to tell a good story visually. Twenty-seven explosions in search of a plot does NOT make a good movie, in my opinion. CGI is no substitute for genuine character development, and SPFX cannot take the place of a good, you know, story. I write this, knowing that I have friends in the movie business, both writers and actors. And truthfully, I don’t object to good visual effects – in fact, I love them. I think the “Star Trek” reboot movies are a good example – especially this most recent film, “Into Darkness.” I thought it had a really good story that was really well told, and for once, the effects – including the 3D – actually ADDED to the movie’s effectiveness. I saw it in both 2D and 3D, and the 3D shot of the Enterprise rising up out of the clouds was simply gorgeous. And this from a diehard fan of the original Trek TV show, who really wanted NOT to like what these young whippersnappers were doing with my franchise. All of that to say, I don’t think I’m just being an old curmudgeon, “they don’t make ’em like they used to,” sort of guy. I don’t hate technology in movies. I just think I have a right to expect more than that for my $12. I got to spend some time with my brother David and his family last week, and we got on the subject of favorites movies. Actually, I like playing a little game with other movie fans. Here’s how it goes: you pick a category of movie, and list your five favorites from that category. Drama. Action / Adventure. Horror. Comedy. Yes, I know it’s nerdy. And geeky. What can I say? I AM a nerd. And a geek. But you must like the movies too, or you wouldn’t still be reading at this point, right? So here’s how we’re going to play. I’m going to pick five categories of films, then tell you my five favorites in that category – 5 x 5, get it? FIVE ALL-TIME FAVORITES – These are my favorite movies. They are not all necessarily “great” films, but all them continue to touch me deeply. Here’s a link to the complete list of my Top 25 favorites. 5. The Shawshank Redemption. This movie meets one of my criteria for “favorite,” which is that I watch it any time it comes on TV. Tim Robbins and Morgan Freeman are a treat. 4. Tender Mercies. Talk about redemption: at the end of the movie, when Robert Duvall is throwing the football with his stepson, you have the answer to the question, “Why?” Incredible movie. 3. The Quiet Man. The John Ford Company Players at their best, along with stunning Irish scenery. 2. Butch Cassidy and the Sundance Kid. A sentimental favorite because it was the movie Kathy and I went to see on our first date. Then 30+ years later, we went to see it at the Paramount on our anniversary. 1. Casablanca. Is it a war movie? Is it a romance? Is it a character picture? Yes, all of that, and more. Bogart. Bergman. For all sorts of reasons, everybody comes to Rick’s. FIVE FAVORITE WAR MOVIES – So-called “war” movies are sometimes accused of glorifying violence, but I think a good one has just the opposite effect, showing the waste and futility. Here are five good ones. 5. Gettysburg. Jeff Daniels shines as the speech professor-turned-colonel Joshua Lawrence Chamberlain who receives the Medal of Honor for his actions at Little Round Top. 4. The Enemy Below. Robert Mitchum and Curd Jurgens are amazing as the American and German captains opposing each other. Who – or what – is the real enemy? 3. Saving Private Ryan. I always wondered what it would be like to be behind a landing craft door when it dropped open. It ain’t pretty. 2. Twelve O’Clock High. Gregory Peck as a good man struggling under the burden what he must do to push his men and accomplish the mission. 1. The Guns of Navarone. Another great Gregory Peck role, with another fine cast. David Niven is terrific. FIVE FAVORITE JOHN WAYNE MOVIES – John Wayne is, and always will be, known for his Westerns. But I think he was often at his best when he took that persona and translated it into other kinds of movie storytelling. Honorable mention: Hellfighters. 5. The Shootist. The Duke’s last movie, playing an aging gunfighter who just wants to die in peace. All actors should go out so well. 4. True Grit. Come see a one-eyed fat man. 3. The High and the Mighty. John Wayne is a pilot on a doomed airliner. 2. Fort Apache. Watching him work with Henry Fonda was always a treat. 1. The Quiet Man. Sean Thornton, home from America, to forget his troubles. FIVE FAVORITE COURTROOM DRAMAS – Trials naturally lend themselves to good movie making. Life and death, freedom and imprisonment, right and wrong. Another of the great ones (even though it’s not on this list): Inherit the Wind, with Spencer Tracy and Fredric March. 5. The Caine Mutiny. Humphrey Bogart is great; Jose Ferrer is superb. Fred McMurray is agreeably spineless and slimy. 4. The Verdict. This was Paul Newman’s greatest role, in my opinion, as an alcoholic ambulance-chaser looking for redemption. 3. A Few Good Men. Aaron Sorkin writes, and Tom and Demi go up against Jack. You can’t handle the truth. 2. To Kill a Mockingbird. All aspiring actors (and trial lawyers, for that matter) should have to watch Gregory Peck’s closing argument to the jury. This is how it’s done. 1. Twelve Angry Men. Oh my, what a cast. A tense, real-time drama of a jury that votes 11-1 for a conviction. Then Henry Fonda starts asking questions. FIVE FAVORITE BASEBALL MOVIES – I think it’s fair to say that there have been more great baseball pictures, than all other categories of sports movies combined. This summer’s 42 is also really, really good. 5. The Sandlot. Friends and summers and growing up. And James Earl Jones ain’t bad. 4. A League of Their Own. You know it as well as I do: There’s no crying in baseball. 2. The Natural. Yes, it’s cheesy and melodramatic at times. It’s still wonderful watching Redford knock the cover off the ball. There goes Roy Hobbs, the best there ever was. 1. Bull Durham. Okay, this movie has some of the dirtiest language ever put on celluloid, and I really can’t recommend it for that reason. But it captures the joy of the game and essence of baseball in a way few others have ever matched. The rose goes in front, big guy. There, see how easy that was? So now, get your Siskel & Ebert on, and come up with some lists of your own. And please pass the popcorn. It seems an appropriate day to reflect upon the current state of race relations in this country. Cheerios received so much hate mail after it began airing that they had to disable comments on the YouTube page where it was posted. It’s worth noting that there were hateful comments being posted by both white and black viewers. Item: Before a recent San Antonio Spurs NBA game, a little Hispanic boy in full Mariachi costume sang “The Star Spangled Banner.” Twitter erupted in a furious barrage of hateful racist comments. Never mind that the boy’s family are legal citizens, and that San Antonio as a city is older than the American republic, and has a long history of bi-racial culture. These two incidents point out to me that although this country has indeed made great strides in pursuing liberty and justice for all, we still have a long way to go. Yes, America has a black president, and Texas has an hispanic senator, but we’re not there yet. Fifty years ago, Dr. Martin Luther King, Jr., pointed out that the most challenging part of the civil rights struggle was NOT the vicious, hate-filled speech of the bigots; rather, it was what he called “the appalling silence of the good people” who saw what was going on, yet chose to remain silent. It’s not enough to say, “Well, I don’t even notice a person’s skin color.” We must work to do more – even to go out of our way to help. When Jesus was asked, “Who is my neighbor?,” He responded with the Parable of the Good Samaritan. Someone of a different ethnic background, a different social class, a different religion, yet going out of his way to reach out to another person. Note, too, that as far as the behavior of the “religious” people in the story, their response to the need in front of them was an #epicfail. President George W. Bush and others have observed that 11:00 AM on Sunday mornings is still the most segregated hour in America. People of good will of all races must work to change that, to bring about the multi-racial, multi-lingual, multi-generational Kingdom of God. It doesn’t come by our own efforts, that’s true – it comes through the work of the Holy Spirit. But we can certainly hinder it from coming, just as the lack of faith on the part of the people in Nazareth hindered Jesus from being able to very much in their midst. Let us have the spiritual courage to pray for God to open our eyes to whatever prejudice or hatred may be in our hearts, and for the faith to work to build bridges rather than walls. Let us seek out others of good will, that we may be a witness to the lost of the essential Oneness of God’s people, no longer slave nor free, male nor female, Jew nor Gentile, but all one in Christ. Like many little boys who grew up in the 50s and 60s, one of the earliest toys I can remember playing with was an electric train. Unlike many others, I never outgrew the fascination. Other kids might have received a train by Lionel or American Flyer; in my case, it was made by Marx. I don’t remember much about the actual train, other than playing with it until it absolutely fell apart. Marx Toys was the same company who would later make the “Rock ‘Em, Sock ‘Em Robots” and the “Big Wheel” tricycles, but to me, they will always be a maker of trains. When I wasn’t playing with trains, I was reading about playing with trains. 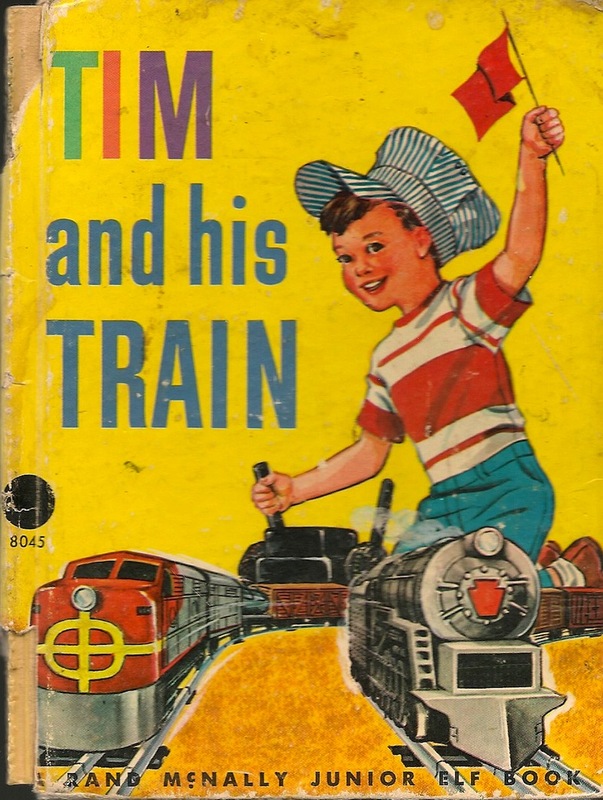 My favorite book as a kid was Tim and His Train. It told the story of a boy who loved trains (I could relate! ), and whose dad took him to visit a rail yard. 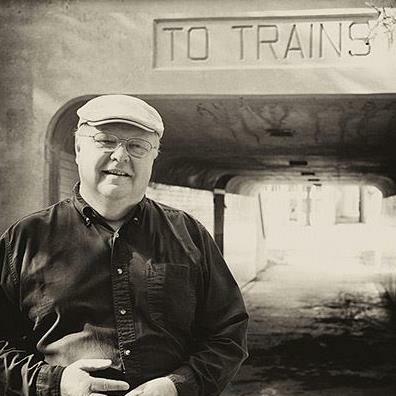 When Tim’s birthday came around, he found a complete train set waiting for him. I thought he was just about the luckiest boy in the world. Like many hobbies, model trains have their own jargon. One of the first things you learn is about scale – how large or how small are the models? The classic Lionel trains are known as “O” scale – pronounced, “oh scale.” O scale operates on the ratio of 1 to 48; that is, one inch on a model equals 48 inches in real life. A man 6 ft. tall in the real world would be a model an inch and a half tall. O scale models are big and impressive to watch as they go by, but they can also be expensive, and they can take up a LOT of room for a layout. The most popular size are known as HO models – you pronounce the letters separately, as in “aitch – oh” scale. The name came from the fact that it is roughly half of the size of O scale models, or H-O. These models have a proportion of 1:87 – one foot of track equals 87 feet in real life. You can build a decent layout on a 4′ x 8′ sheet of plywood, which is how a lot of hobbyists start out. There are many other scales, each with their own devotees and specialties – Z (1:220), N (1:160), HO (1:87), S (1:64), O (1:48), and G (1:29). Each has different advantages – you can built a nice Z scale layout in a suitcase, whereas G scale is often the choice for running outdoors on garden railroads. It all depends on what you like. I’ve played around with different scales over the years, but I’ve recently come back to modeling in HO scale. 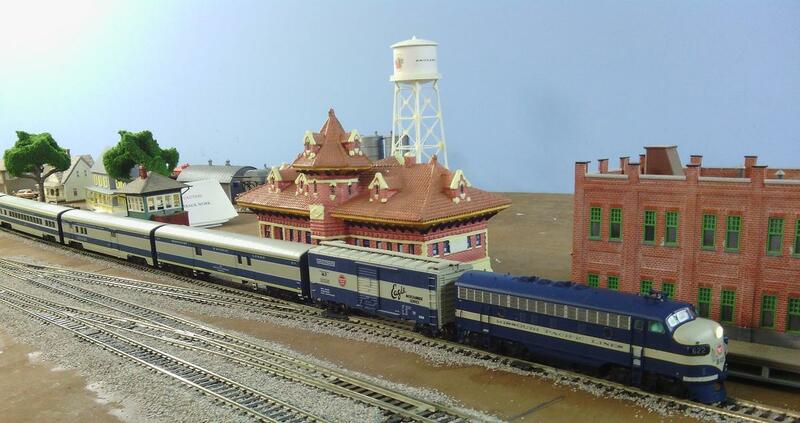 Here’s my model of the 1950s vintage “Texas Eagle” as it pulls past the Abilene station. One reason that model railroading is such a popular hobby is that it incorporates many different hobbies in one. The hobby can involve carpentry, architecture, engineering, electrical skills, computer programming, history, research, and many other sub-interests. You can express your artistic self with scenery for any and all types of terrain and landscapes; you can recreate a memory from the past, or come up with an original expression of things the way you think they ought to be. You can create something out of pure whimsey – the Hogwarts Express visiting a train station on Vulcan – or produce museum-quality reproductions that are accurate right down to the number of rivets. Some guys enjoy operating their model as a real railroad, complete with timetables and switching lists, making up trains, moving them over the road, picking up and dropping off cars along the way, and doing it all on time. Other guys just enjoy watching their train tick off the miles as it goes by, enjoying the smooth running operation of the engines and cars. Some enjoy reproducing modern railroading, with its double-stack container trains and high-horsepower modern diesels, while others prefer the “old timey” tea kettle steam engines and short trains. It just depends on what you like. One of the most revolutionary developments has been something called “Digital Command Control,” or DCC. In the old days, when you turned on the power to a particular stretch of track, every engine on it moved at the same time. This led to elaborate wiring schemes and dividing the track up into numerous “blocks,” each insulated from the others, so that you could turn on power to one little section of track at a time. Obviously, not a realistic approach to running trains! DCC has changed all that. Now, it’s possible to install a little computer circuit on the engine, and give each engine a unique code number. With DCC on board, your controller sends out a coded signal that is read and understood ONLY by your engine. This allows you to run multiple trains on the same stretch of train, each independent of the others. You can even install miniature speakers on the trains, enabling engines to operate with realistic sound effects. All this allows for a level of realism previously unimaginable. One thing people always want to know: isn’t it expensive? Well, it can be (especially when you’re just getting started), but it doesn’t have to be. In my case, I don’t have the space – or the budget – to have a big layout, but I’m a member of the Abilene Society of Model Railroaders. The ASMR has a nice layout that the members are continuing to build. As a member, I can run my trains on the club layout, AND even better, I can tap into the knowledge and experience of guys who are much better modelers than I. In recent years, several manufacturers of model trains and other interested businesses have formed a trade group devoted to promoting the industry. It’s called “The World’s Greatest Hobby.” That may be a bit of an exaggeration, but then again, maybe not. After all, what other hobby allows you to build and operate your own rail empire, create cities to suit your taste, travel over vast distances, and even go back in time?